My husband and I traveled to Wilmington, North Carolina to take a four-hour nature cruise up the Cape Fear River to the Black River. 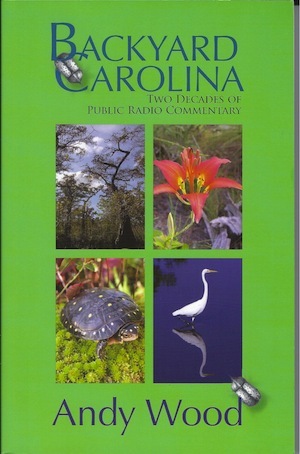 Andy Wood was the naturalist on board, a Coastal Ecologist & author of a wonderful book, “Backyard Carolina: Two Decades of Public Radio Commentary”. This little book is a series of essays, perfect for the busiest of us to pick up and read for just a moment. Then we come away smiling and refreshed, secure in the knowledge that although life isn’t easy for even the smallest of creatures, life does go on. I shuddered when I read Andy’s account of rescuing a snapping turtle because I had nervous twitches trying to get an injured snapper into a box. I knew this heavily armored beast could reach almost all the way around that great shell and clamp on an unsuspecting hand. You don’t have to have wildlife rescue experience to enjoy this book. If you have ever experienced the joy of watching a wren’s antics at the feeder or the bullying attitude of an anole lizard or just want to join in the experience of these encounters, you will, as I, love this book. Rivers and their inhabitants, both above and below water, hold a special spot in Andy’s heart. Read about rails, herons, and ibis. From the lowly mosquito larvae to mud dauber wasps to pileated woodpeckers and hooty owls, they all populate the book and many of our backyards. One of those strange river inhabitants is the magnificent rams-horn snail (Planorbella magnifica). Andy has taken it upon himself to save magnifica, as he calls it, not just from extinction but also from the Federal Endangered Species list. Magnificent rams-horn snails do inhabit the North Carolina State Endangered Species list. The magnificent should not be confused with the common rams-horn snails found in pet shops. These smaller rams-head snails proliferate in aquariums nationwide. When we are too busy to notice the inhabitants of a wet weather pool, Andy stops and takes us there to marvel over “the tiny fairy shrimp swimming gracefully just under the pool surface.” These tiny shrimp hatched from dormant eggs laid 5 years earlier, just waiting for the right conditions to continue their life span. Available from Amazon.com and Barnesandnoble.com or check with local booksellers. About Andy Wood: He is a fourth generation biologist who teaches about the natural world through commentary on the local Wilmington public radio station and through natural history tours on the Cape Fear and Black Rivers. He is the former education director of the North Carolina Audubon Society. Andy is the Director of the Coastal Plain Conservation Group a non-profit dedicated to finding coastal landowners who will provide habitat for threatened species. In 2007, the National Society of the Daughters of the American Revolution presented Andy with their Conservation Medal for his lifetime work in conservation-education.